With a frequency response down to 15 Hz, and a maximum SPL capability in excess of 130 dB, the 7382 is Genelec's most powerful subwoofer to date. Combining power and clarity with flexible calibration and bass management features, the 7382 is designed for use in recording studios, film mixing facilities, mastering suites, post-production houses, EDM playback and premium home theatres, and integrates perfectly into any system from simple stereo to 40+ channels of immersive audio. The 7382 enclosure contains three 15-inch custom-designed high-performance woofers driven by a powerful Class D amplifier section and a laminar flow bass reflex port running along its entire rear wall. This combination enables high SPL, low frequency cutoff and low distortion performance – resulting in precise bass articulation even at the very lowest frequencies. As part of the growing SAM family of Genelec monitors and subwoofers, the 7382 tightly integrates with GLM software, via which it can be configured, calibrated and controlled. GLM offers control of bass management, solves issues of subwoofer placement in unpredictable rooms, and even allows the creation of entire arrays of Genelec subwoofers where required. GLM also doubles as a comprehensive Mac or PC-based monitor controller, allowing you to calibrate your listening level to accepted loudness standards, switch between formats, monitoring systems and primary listening positions – and much more. 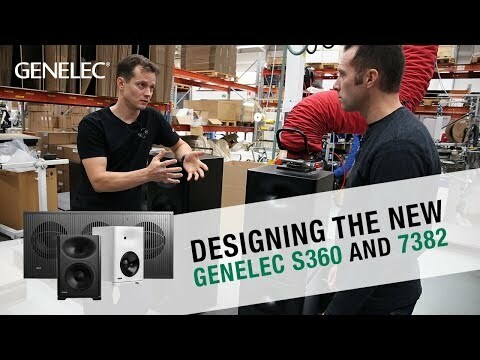 Want to know more about the thinking behind our new S360 and 7382 high-SPL models? Darren Rose goes behind the scenes with our design team to get the answers.